1. What is Tania Reference Design Kit? 2. I already have Denebola CX3™ RDK / Ascella ISP RDK. What is the difference between the Denebola CX3™ RDK / Ascella ISP RDK and the TANIA CX3_SNI_ISP_RDK? 3. I see that, there are 21MP and 13MP camera modules. Can I have the datasheet of those camera modules? 4. Are these 21MP and 13MP camera modules continuous or single triggered autofocus? 5. What lenses are there on the 21MP and 13MP camera modules? 6. What field of view can I get on the 21MP and 13MP modules? 7. What is the focal length of the autofocus lens kit installed on TANIA? 8. What is the smallest distance of capture with the camera modules? 9. Who is the target audience? 10. If I want to build a 21MP/13MP USB3.1 Gen1 camera using your design, would you support me? 11. Do I get the schematics of TANIA kit? 12. I see that there are two camera modules. Which is the Front and Rear camera module? 13. Is there a picture that clearly explains, where these camera modules are on TANIA kit ? 14. Who is SocioNext Inc.? 15. I have a sony sensor and I would like to use the CX3™ chip. Can I have access to the SocioNext ISP? 16. I want to use a different image sensor. Can I use this kit to interface? 17. Can I get access to ISP registers? 18. Can I get access to camera module registers? 19. Is the TANIA RDK refundable? 20. Can I get a free sample for testing? 21. What sort of support does e-con Systems provide along with the kit? 22. Is there any software available with the kit? 24. What are the supported Operating Systems? 25. The camera is not suitable to my requirement. Can I return the kit? 26. The kit is getting very hot. Is it suitable for usage? 27. I would like to use a different lens. What is the NRE charge? Cypress® CX3™ Socionext ISP Dual (21MP and 13MP) Autofocus camera RDK - TANIA is a joint reference design kit developed by Cypress® Semiconductors, Socionext, Inc. and e-con Systems. This kit is developed to promote the Cypress® EZ-USB™ CX3™ USB Camera controller chip with SocioNext Milbeaut MBG967 ISP (Image Signal Processor) along with SONY IMX230 and IMX258 image sensors based auto focus Camera Module. Customers can use this kit as it is or customize the same with the help of e-con Systems to meet their form-factor requirements or other requirements. This TANIA RDK is a USB3.1 Gen1 UVC-compliant camera and does not require any drivers to be installed on the popular Operating Systems such Windows (7/8/8.1/10) and Linux. e-con Systems will later extend support for Mac OS. The primary difference between the Denebola /Ascella and TANIA is that the TANIA RDK incorporates the Socionext's Milbeaut MBG967 and Dual (21MP rear and 13MP front) camera modules based on Sony IMX230 and IMX258 image sensors. Ascella incorporates THP7312 Image Signal Processor (ISP) and OmniVision OV13850 based Autofocus camera module. Denebola RDK does not use any external ISP and uses OmniVision® OV5640 sensor based 5MP Autofocus camera module. OmniVision® OV13850 RAW (Bayer format) Image Sensor. This kit uses an external ISP THP7312 ISP from THine® Electronics, Inc.
Sony IMX230 and IMX258 dual Image Sensors. This kit uses an external ISP Milbeaut MBG967 (M-12MO) ISP from SocioNext, Inc.
THP7312 ISP from THine® Electronics, Inc.. External on-board ISP. Milbeaut MBG967 (M-12MO) ISP from SocioNext, Inc. External on-board ISP. USB 3.0 and USB2.0. UVC compliant. USB3.1 Gen1 and USB2.0. UVC compliant. Complete schematics available. Open to all. Partial schematics only. For full schematics, customers can request from THine® Electronics Inc. THine® reserves the right to disclose the schematics. Complete firmware available in source code, except for OV5640 sensor settings library, which is available from e-con directly if the customer has NDA with OmniVision. Partial firmware only. The ISP firmware, ISP register settings and CMOS sensor settings are not available in source code. Complete firmware available and shall be provided to qualified customers. Customers can integrate any other sensor with Denebola and develop the firmware on their own. Supporting new sensors has to be decided on case to case basis based on production volume. Interested customers can contact e-con at sales@e-consystems.com directly. Full development support from e-con Systems. As the full design information is already available, customers can develop on their own. Yes, please write to sales@e-consystems.com for the 21MP and 13MP camera module datasheets, explaining about your project application and volume requirements. These camera modules have a voice coil motor (VCM) based focus mechanism. The ISP on TANIA RDK supports both single-trigger autofocus and continuous autofocus. The lenses used in 21MP and 13MP camera modules are high resolution lenses with IR cut-off filter. The EFL are 4.62mm(21MP) and 3.462mm(13MP) and the F.No is 2.2 for both 21MP and 13MP camera modules. The smallest working distance (distance between the camera and the object) for both camera modules are 10cm. This TANIA RDK is targeted for customers who want 21MP and 13MP autofocus capability mainly with sony sensors. The camera modules can individually support typical applications like Document Readers, OCR applications, Video conferencing applications, Still image capture applications for photo booths etc. Dual camera streaming can also serve in specific areas where multiple cameras are required to operate simultaneously .The RDK firmware has been enhanced with a wide range of features allowing customers to develop their products with only the subset of firmware features. Yes, e-con can support building your 21MP/13MP USB 3.1 Gen1 camera as per your requirements using the TANIA RDK as the base. This customization on the PCB (shape and form-factor), firmware and software is possible from e-con Systems. 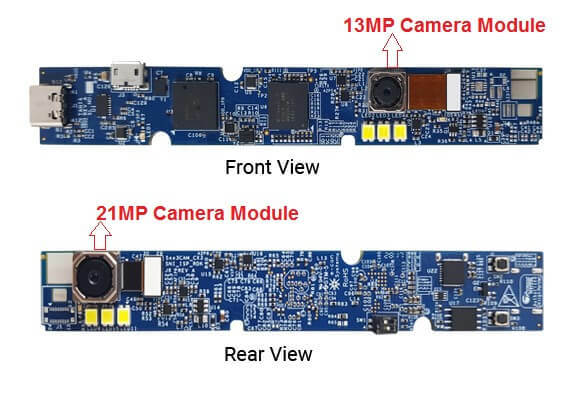 e-con already has 13MP camera boards (See3CAM_CU130 & See3CAM_CU135) for applications involving M12 interchangeable lens for the customers who do not want to use the autofocus module but want the flexibility to use fixed focus lenses as per their requirement. Yes, please refer the picture describing each of the camera modules. SocioNext Inc. (http://www.socionext.com/en/ ) is a leading semiconductor company and their ISP chips are very powerful and highly sophisticated. e-con Systems is happy to be a partner of SocioNext since it helps e-con Systems in supporting e-con's customers worldwide. The TANIA Kit has dual camera module that bring out the best picture quality with the use of an external ISP Milbeaut MBG967 from SocioNext. Supporting new sensors has to be decided on case to case basis based on production volume. Please contact sales@e-consystems.com for more information. Please contact sales@e-consystems.com for the list of sensors that can be supported by default with little firmware modification. However, if your required sensor is not there in the list, then the required volume of production for support would be 100,000 pieces (One hundred thousand). No. Currently, this is not available. No. The sensor registers are directly controlled by the ISP. The TANIA RDK is currently non-refundable. TANIA samples are not available for free. You can purchase them from our online web store. e-con Systems shall provide the basic support on the evaluation for all the customers who have purchased the kit. e-con shall provide the hardware/software/firmware customization of the kit based on your requirements. e-con will also manufacture your custom cameras and supply them to you. Yes, we provide the e-CAMView (windows) and QtCAM (Linux) sample applications demonstrating the capabilities of this TANIA kit. Windows (7/8/8.1/10) and Linux (with Ubuntu LTS) are supported. The kit is non-returnable and non-refundable. However, the kit is under warranty and e-con will replace for any failed kit under warranty terms. Yes, but the camera module needs an external heat sink to dissipate the heat for prolonged usage. If your application requires fixed focus custom lens, contact sales@e-consystems.com.